How to Solve Common iPhone Storage Issues? One of the most annoying things about iPhone is storage errors that you get every now and then. Moreover, these errors generally occur at some of the most important of times, like when you want to capture a moment, update the game you love, download a new app, etc. So, how to solve common iPhone storage issues? Spotlight search feature could be one of factors that caused iPhone storage Problems. If you use the spotlight search feature in your iPhone or iPad, you will find out that deleted data are only visible for search mode.Therefore, you should delete it permanently to obtain more storage. (1) Tapping on Settings> General> Spotlight Search and then scroll down to uncheck the Messages option. You are then required to turn your device on and off 2-3 times to successfully get rid of these messages. 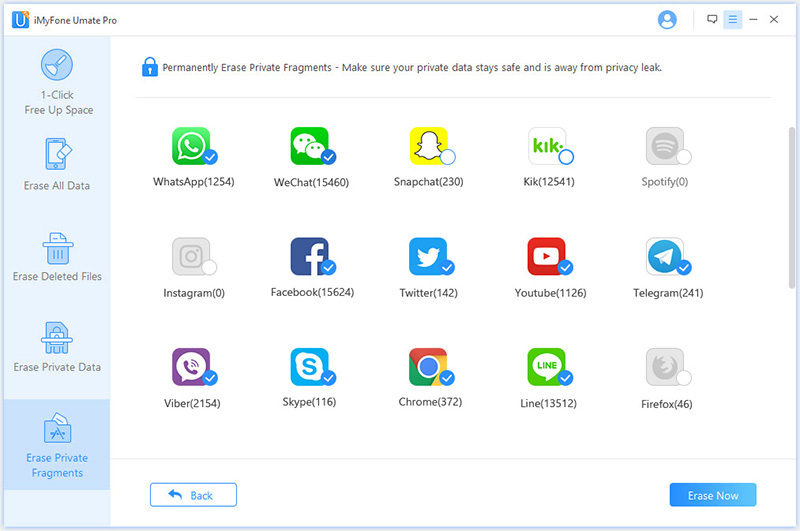 (2) These Spotlight messages are actually a type of junk file which you can easily delete by selecting the "1-Click Free Up Space" feature of iMyFone Umate Pro or iMyFone Umate Pro for Mac . Step 1: Connect your device to software. Step 2: Choose "1-Click Free Up Space" mode and click on Quick Scan to enable the software to analyze. Step 3: Tap "Clean" for junk file option on the report screen and clean it. The Spotlight messages will be gone. While many of you might already know that the cookies, cache and browsing history only consume a very small amount of space in the iPhone, do you know that over time they can accumulate and consume considerable amount of space in your device and lead to iPhone storage issues. (1) Go to the settings of your iPhone, then go to browser settings to delete cookies, cache and browser history. However, this method is not highly effective, some of the users have also complained that this method sometimes not working at their devices. 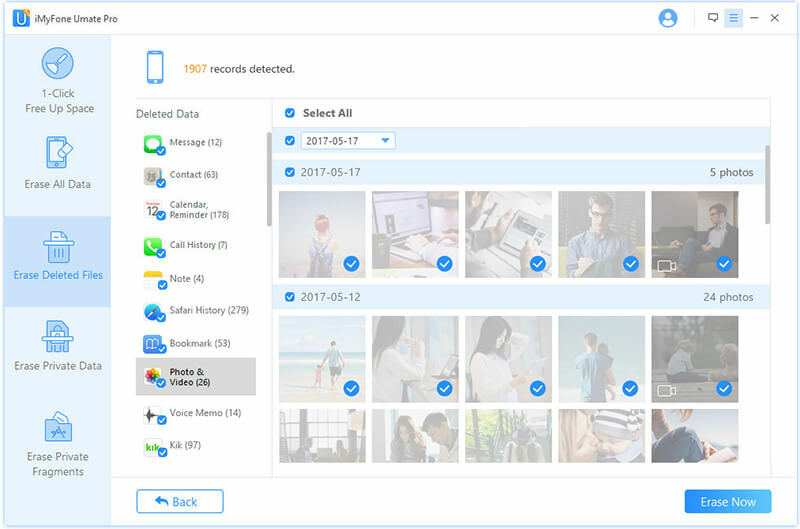 (2) A better solution for clearing cookies, cache and browsing history from your iPhone is to use iMyFone Umate Pro which can permanently erase your Safari Data via "Erase Private Data" mode. The erase data is 100% unrecoverable. Many of you may don't know that private fragments also incur iPhone storage management problems. If you have already updated your device to the latest iOS 10.3, then you should know that there are certain fragments accumulate. Over time, it could be a eater for your storage. iMyFone Umate Pro allows you to instantly erase all the third party app fragments from your iOS 10.3 device. you just need to choose the "Erase Private Fragment" mode and start scan for your device. After scan, you will be able to erase all third party app fragment. Such as WhatsApp, Wechat, Snapchat, Kik, Instagram, Facebook, etc. If you use an iPhone SE with 16GB memory, you might already know how annoying the storage errors can be. Erase all data could help you to obtain much storage for once. Generally it is recommended that you should delete unnecessary files. However, the reality is that when you delete things from your iPhone SE, many of them can still be restored by using a variety of tools on the internet. And to be frank, who really has go that much time to clear the storage every now and then? So, an iPhone cleaner like iMyFone Umate Pro will help a lot, as it allows you to 1-click erase iPhone data in bulk. How to Make Your iOS Device Run Faster? iOS devices run slow and often up while using an app, listening to songs or playing games. This is one of the most common problems that arise due to insufficient storage in the device. Don't be anxious. 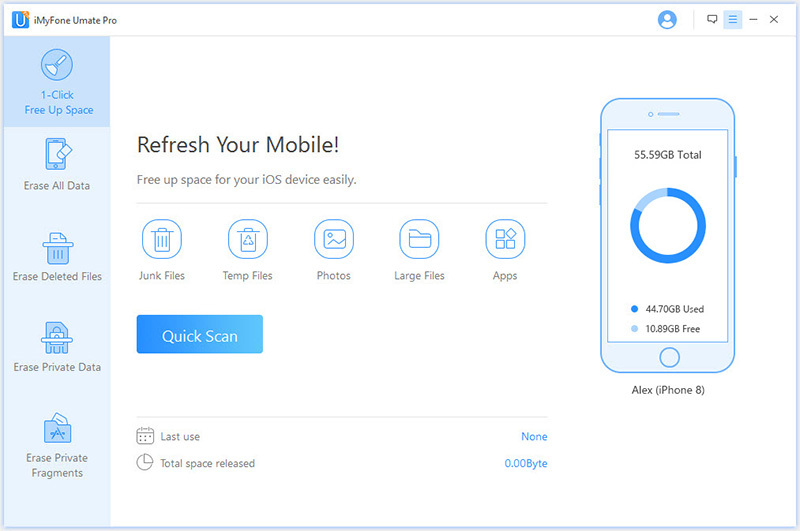 iMyFone Umate Pro provides users with a simple way to erase files from iOS device. Once the memory is free, users will see that their iOS devices now run much faster. How to Clear RAM on iPhone X iOS 12?